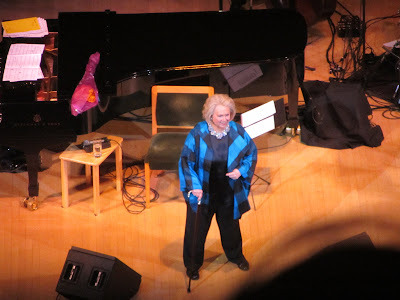 Last night we gathered at Carnegie Hall to hear Barbara Cook sing and swing songs from her latest album, Loverman. Although the official day isn't until October 25th, this was a huge 85th birthday concert for Miss Cook. It's been an amazing couple of years for her - back on Broadway in Sondheim on Sondehim and then in 2011, most blessedly and deservedly becoming a Kennedy Center Honoree. It's an inspiration to see lady of her age not just resting on her laurels, but still recording and sharing herself and her art. 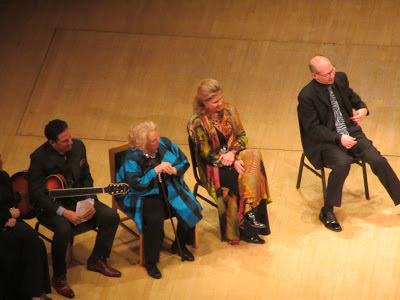 After serenading us for over an hour and half, some friends of hers took the stage to serenade her in turn, suprising and delighting all of us: John Pizzarelli, Jessica Molaskey, Susan Graham, Sheldon Harnick and Josh Groban. I'll listen to Barbara sing anything, but I especially loved this set. It's all great American songs by songwriters, to paraphrase Barbara, who if they only had written this one song, it would have been enough. I was particularly grateful that she included Hoagy Carmichael's "The Nearness of You." Most beautiful was the pairing of "House of the Rising Sun" with "Bye Bye Blackbird" (which happens to be one of my favorite songs, sung by anybody, anytime) and she finalied with a stunning a capella rendention of John Lennon's "Imagine," from the edge of the stage. She shared little snippets and stories about her career and told some hilarious jokes. She had us all doubled-over with her confessions of her youtube surfing addiction. She's very off-the-cuff and down-to-earth and it really feels as though you're in her living room. We were teased with the promise of "special guests," but after Barbara carressing us for the entire time with her warmth and humor we thought perhaps that it was all there was. But when she took the stage again on the arm of John Pizzarelli, she seemed as surprised as we were. John proceeded to read a letter from Mayor Bloomberg wishing her a happy birthday and proclaiming her as one of New York City's living landmarks. 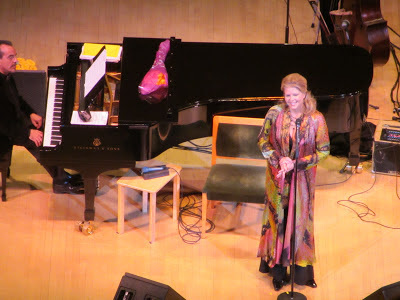 John's wife Jessical Molaskey joined them on stage and they proceeding to sing a silly and sweet set from No No Nanette, which was written just before Barbara's birth. Next to surprise us all was mezzo-soprano Susan Graham. Barbara is a huge fan of opera and of Susan's - I once stood in line with Barbara to greet Susan after her final performance of Der Rosenkavalier at the Met. She shared her story about being a little girl and hearing a beautiful voice for the very time - Barbara's voice singing "Till There Was You" from The Music Man on the hi-fi. She then proceeded to serenade Barbara with her own rendition of this song, sans microphone. It was divine! 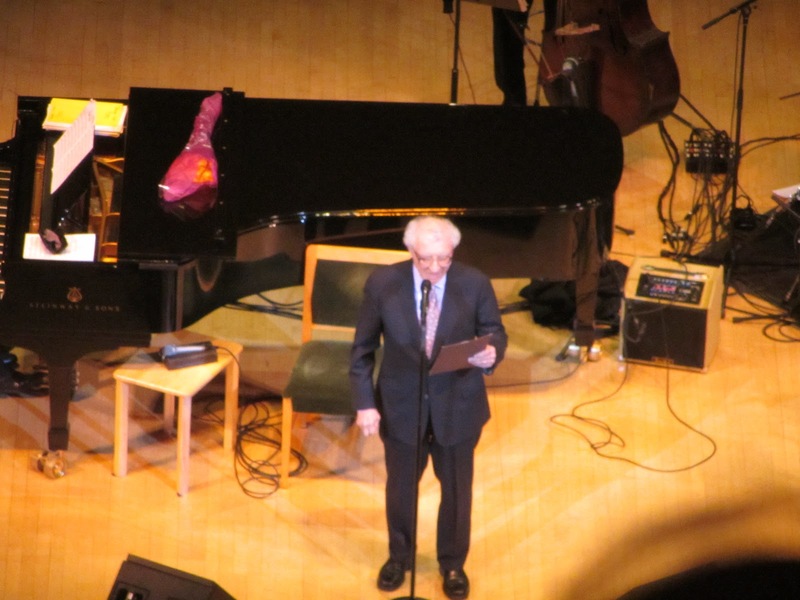 Tony and Pulitzer winning lyricist/book writer Sheldon Harnick then joined the party. He sang a song he wrote for Barbara, a take off from "Ice Cream" from She Love Me. Barbara starred in the original Broadway production of She Loves Me, by Harnick and Jerry Bock, in 1963. Next, Josh Groban took the stage to sing Sondheim's Not While I'm Around from Sweeney Todd. 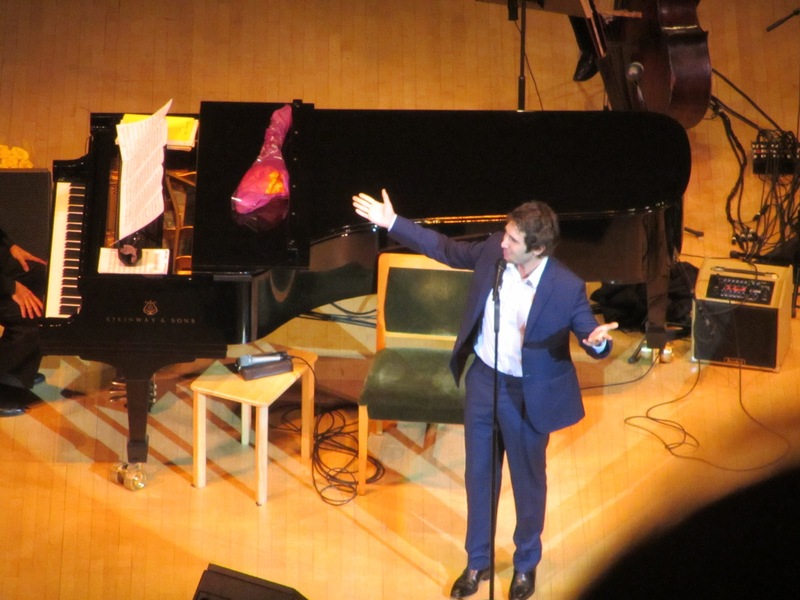 Barbara is a huge fan of Josh's - we saw him perform with her at her concert at the Metropolitan Opera in January, 2006. Finally, we all joined in to sing Happy Birthday to Barbara. It was as thrilling an evening as any when it comes to concerts by Barbara Cook. It doesn't matter if I see her from the balcony at Carnegie Hall or at at a table near the stage at Feinstein's, I always feel as though she's singing and talking right to me. She's our grandmother telling us sweet - and somewhat baudy - stories and making us feel warm, happy, and loved. I've been following Barbara for 55 years, and her voice still thrills me. Happy Birthday to a lovely star.